Originally from Ontario, Canada, Heather started working at SWAC in 2008. She loves meeting the students for the first time and walking with them through their education at SWAC. She is passionate about the medicine and excited to make each students’ experience at SWAC the best possible. She is also passionate about golf and family time. Joanne originally hails from the east coast, mainly New York and New Jersey, coming to Boulder for the first time in the early 80s and knowing it was home. She is a SWAC alumni, graduating from the Boulder campus in 2002. Since graduating she has been in private practice and has come through the ranks at SWAC, first as a TA, then teaching and supervising clinics and has been the Clinic Director since August 2007. She is on campus to help with any clinical questions and keeps things running smoothly in clinic. In her off time she loves to participate in Yoga Fit & Jazzercise classes, hiking and riding her motorcycle in the fabulous Colorado sunshine. Nate graduated with his Masters in Oriental Medicine from East-West College of Natural Medicine (2003) and a Doctorate in Acupuncture and Chinese Medicine from American College of Traditional Chinese Medicine (2018). He specializes in the treatment of headache/migraine and Tan/Tung distal acupuncture. He also specializes in the identification of wild medicinal plants, he has written a field guide for the central Rocky Mountains. In addition, he is a 28-year practitioner of martial arts (Shuri Ryu Karatedo and Chen Shi Taijiquan). Rhonda began working at SWAC in 2014. After being a stay at home mom for seven years, she decided it was time to learn how to talk to adults again. The second she walked through the doors, she knew this was the place she was suppose to be. After working in the clinic for a year, Rhonda expanded her role to include recruitment, and then went on to become the Administrative Director. Over the years, her roles have changed at SWAC, but the love for the school, passion for the students, and the her pride in providing excellent customer service have never wavered. In her free time, Rhonda enjoys playing with her little people, hiking, and dark chocolate. Cindy has been enjoying the sunshine and outdoor activities of Colorado since moving here from Ohio after graduate school. She has worked at SWAC since November of 2013. Cindy has previously worked as a community mental health counselor, vocational rehabilitation counselor, and Disability Coordinator at the University of Colorado at Boulder. She recently completed a certificate in teaching English as a Second Language and tutors English. Steve Milberger graduated from Emporia State University in Kansas with a Master's Degree in Library Science in December of 1992. Most recently, Steve honed his library skills at the Mamie Doud Eisenhower Public Library from 2008 to 2017. While at MDE Public Library Steve became involved with the makerspace movement and researched, designed and taught classes in: basic and advanced soldering, model rocketry, Arduino, Raspberry Pi, Linux/open-source software and digital audio recording. Steve's hobbies include watching and collecting movies, music, all things involving the electric guitar, building electronics and building and upgrading PCs. Steve has had a life-long fascination with Asian culture and has studied Goju-ryu karate, taijiquan, baguazhang and xing-yi. Laura was raised in Miami, Florida by a family of entertainers. Since moving to Colorado in 1980, she now considers herself a native! Laura is passionate about singing, her three kids, and food! She is just beginning her journey at the Southwest Acupuncture College, and brings warmth, a fantastic and funny sense of humor, and a whatever it takes attitude to learning and growing in her position. Beth is excited to be part of the SWAC community! As a former teacher, she knew that she would enjoy being involved in the education and growth of the students. In her free time she loves the outdoors as well as try out new recipes. Originally from Maryland, Phil moved out to Colorado in 2009. He received his B.A from Naropa University in Traditional Eastern Arts with a focus in Yang style Taijiquan (2015). He then went on to receive his Masters in Nutrition from National University of Natural Medicine (2018). He is passionate about exploring “food as medicine” and the impact diet has on our overall health. His other main interests include playing/producing music for film, hiking, and cooking yummy food. Phil is excited to be part of the SWAC team and continuing to support its role in serving the health of the front range community! Paul Rossignol received his B.A. in Philosophy with a minor in East Asian Studies from the University of New Mexico in 2000. 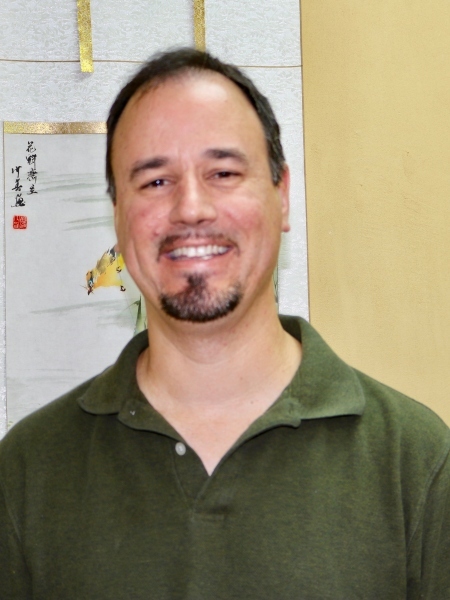 His passion for Classical Chinese philosophy lead him to attend the International Institute of Chinese Medicine and later Southwest Acupuncture College where he graduated with his M.S.O.M in 2005. He has practiced as a D.O.M. privately and as a contracting physician for the University of New Mexico Student Health Center. Paul holds black belt ranking in Aikido as well as master instructors certification in Yang Tai Chi Chuan and Hsing I Chuan. He has instructed Tai Chi Chuan for the University of New Mexico and New Mexico School of Natural Therapeutics as well as Southwest Acupuncture College. He currently serves as the President of the Acupuncture Alumni Association of New Mexico and as a board member for the U.S. I Chuan Qigong Association. Originally from Montana, Susan has cultivated the interest in cultural expression into a life long passion of learning. After living in Tennessee, Georgia, Washington, California, and Arizona, she has found Santa Fe to be a place to call home. Her Bachelor’s degree is in Psychology and Spirituality, and was later followed by a doctoral degree in Depth Psychology and Mythology, which allowed an exploration into the individual stories we choose to live by. She began working at Southwest Acupuncture College in 2015 and enjoys hearing the goals and triumphs of each student. In her free time you will find her in her garden, reading, or engaging in the active imagination with her son. Pamela received her Bachelors Degree in 1992 from the University of New Mexico in Harp performance and Social Psychology. She graduated from Southwest Acupuncture College in 2009 with a Masters in Oriental Medicine, then completed an internship through Heilongjiang University of Chinese Medicine at the Harbin Traditional Medicine Hospital (2009). She is nationally certified with the NCCAOM. Since 2009, she has practiced with her mentor specializing in making and using Chinese herbal remedies. After training with Acupuncturists Without Borders in 2013, she volunteered with the Military Stress Relief Project, a weekly community style acupuncture clinic for veterans, active duty personnel, and their families. She is National Acupuncture Detox Association (NADA) certified and is a NM state recognized Acupuncture Detoxification Specialist supervisor. Pamela currently resides in Albuquerque and enjoys her garden and pet bird. She is the Santa Fe Campus Clinic Director. Originally from Texas, Angela started working at SWAC in 2008, she moved to Albuquerque in 2003 after living on Phoenix, AZ for 3 1/2 years. She enjoys assisting prospective and current students to understand and apply for Financial Aid so that they can achieve their goal of pursuing a life in Oriental Medicine, Angela enjoys hiking and hanging with friends around Albuquerque and Santa Fe. Originally from Los Angeles, Sophia cultivated her creative talent into her passion for film and media. She received her Professional Certificate in Media and Film from Santa Fe University of Art and Design in 2015 and is developing many media projects through her own production company, Wickedly Driven Media. Sophia truly enjoys engaging with prospective students as they make life changing decisions on their education, and staying connected with Alumni on their career paths. Vanessa takes pride in our students and strives for great customer service. Vanessa is always most willing to provide you with assistance and support. If she doesn’t have an answer she will find you someone who does. Jim Kutsko, Chief Financial Officer Jim grew up in Denver and received his B.A. in Marketing from the University of Colorado in Boulder. Soon after graduating he moved down to Santa Fe with his wife and started working in the finance and accounting fields. Jim assists a number of small businesses and non-profits in Santa Fe with their accounting and tax reporting needs. He is also a certified Quickbooks advisor. Jim loves living in the quiet and wide open areas of Northern New Mexico. Elizabeth Martinez, Librarian Born and raised in Southern California, Elizabeth has many firsts in her life being Chicano/Native and Mexican American; first AFS exchange student (New Zealand), first director of Los Angeles Public Library, first Executive Director of the American Library Association. Three years ago, she returned from Monterey County to live here again. She was appointed by the Governor to the NM State Library Commission, and is the new president of the State Library of NM Foundation. She has a son (psychology) and daughter (film FX). Her children were raised with TCM. Sandy Szabat, Administrative Assistant One of the first faces you see at the Santa Fe Campus, Sandy works the reception desk with a smile. A consummate people person, she enjoys welcoming all who come through the door. Sandy has lived across the country, from Connecticut to California with a significant stop in Washington D.C. to attend university where she studied communications and Spanish language. Her work experiences range from radio broadcasting and community-based social work to running a small yoga studio. She is passionate about the wide open spaces of New Mexico and has lived here for over 20 years. Gardening, reading, music and hanging out with her two grown children are her joys. She says, “working in an environment where people are learning and promoting the ancient practices of holistic health is inspiring and educational.” She is proud to be a member of the SW Acupuncture College staff.